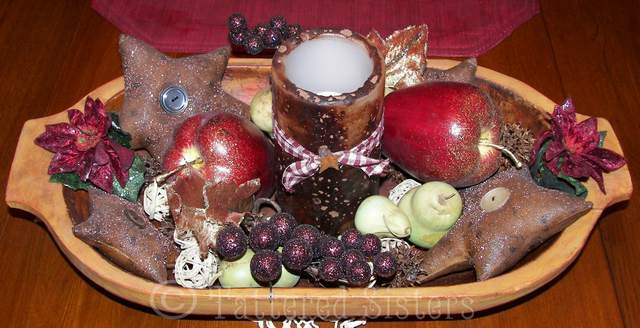 I love the look of a good and grungy primitive candle, but I don't necessarily like to have a real candle burning all the time. So when battery operated tealights and candles became all the rage, I created my Prim Flickers flameless candles to sell in my former online store. I made a few for myself, of course, because I just love the look of them. I've made some as gifts for people too and they are always a big hit. Now these start out as absolutely real candles. I always use 6" white or cream colored candles to allow for the most light to glow through the grungy goodness on the outside. 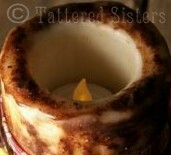 My husband uses a hole saw to drill out the center of the candle for me, and he drills out about 2" or so. I like my tealights to sit down inside the candle itself so it looks more real. After all, if there's a plastic flame poking out over the top of the candle, it's not exactly going to look real, and I want my Prim Flickers to look as real as possible. After he drills out the center, I get my trusty Presto Pot and melt my wax and add Cinnamon Bun scented fragrance oil to it. That is my favorite scent, but you could use any scent you like. When the wax is melted, I carefully start dipping the candle into it a section at a time, then quickly dredging it in cinnamon and other ground spices (nutmeg and cloves are great too). 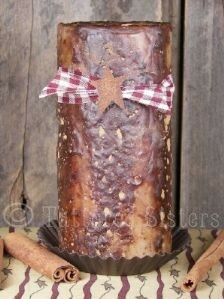 I repeat this process until the entire outside of the candle is coated with as much cinnamon as possible. Then it's time to seal all the spices so they won't come off--and that's just a matter of dipping the candle in the melted wax again, a section at a time, until all sides are good and sealed. Once the candle has been grungy'd to my liking, I take some homespun and tie it around the candle, about 1/3 of the way from the top. 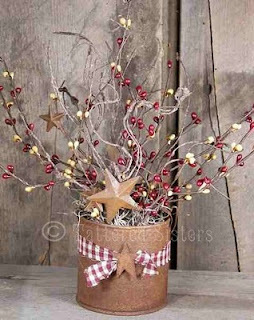 I add a rusty tin star for an accent...and sometimes I even wrap a stem of pip perries around the homespun for a different look. Then all that's left is to add the battery-operated tealight down inside the candle, and set it on a rusty tin candle pan. And there you have it: perfect primitive lighting for any table, counter, or shelf in your home! 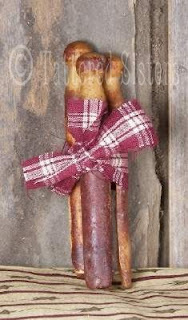 I thought I would share a couple of photos of the primitive Christmas decor I had for this Christmas. I don't have tons of primitive home decor in general--I prefer just primitive touches here and there. 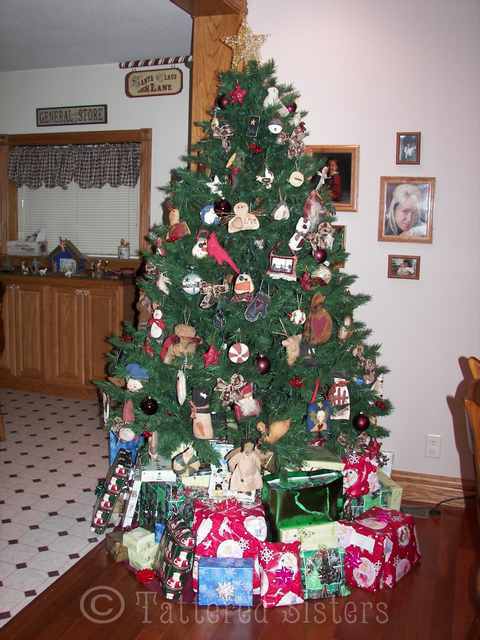 But I do love the look of a Christmas tree filled with handmade primitive ornies, so I thought I'd share that. I'm also sharing the dough bowl centerpiece that sits on my dining room table. It was such a nice Christmas this year...a little bit white (but not too much) and a lot of good memories to carry forward in the coming year. Hope you all have a very Happy New Year! Another great way to use Pip Berries in your decor is by using wall pockets. 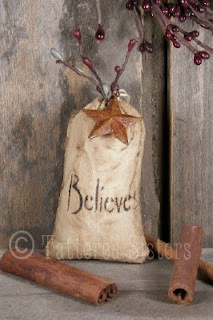 There are lots of different types of wall pockets, but rusty tin stars are one of favorite styles. 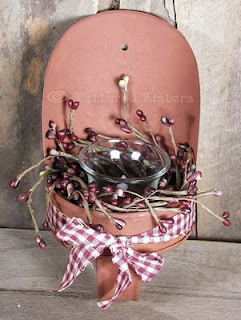 Here is a very simple and easy to make project for your home. 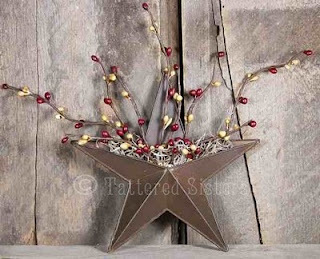 I got the plain rusty tin star wall pocket at an online craft store (can't remember which one off the top of my head). I added some green floral craft foam that I cut into chunks small enough to fit inside the pocket, in order to have something to stick the pip berries in. Once the foam was in, I took one burgundy and mustard pip berry spray and cut it into individual stem pieces. I poked each of them into the floral foam, bending them and arranging them as I went. Once I was happy with the pip berries, then I just took some Spanish moss and tucked it in around the pip berry stems--it gives them some stability, hides the floral foam, and just adds another rustic accent to the arrangement. 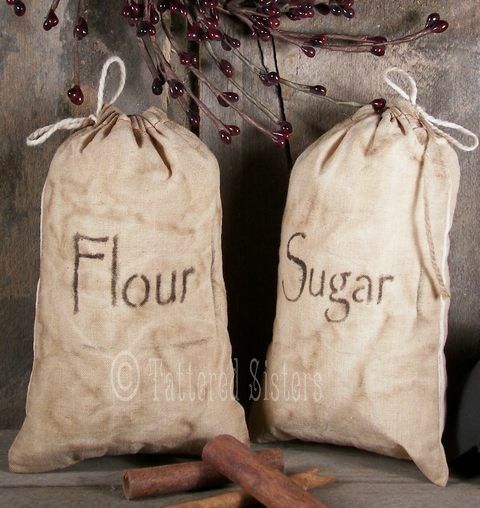 These are great to hang on a wall, or even just setting on a shelf. I really love the look of pip berries. They're so primitive looking, so I really like making things that utilize pip berries whenever I can. And if I can use a rusty bucket or can of some sort at the same time...well, even better. 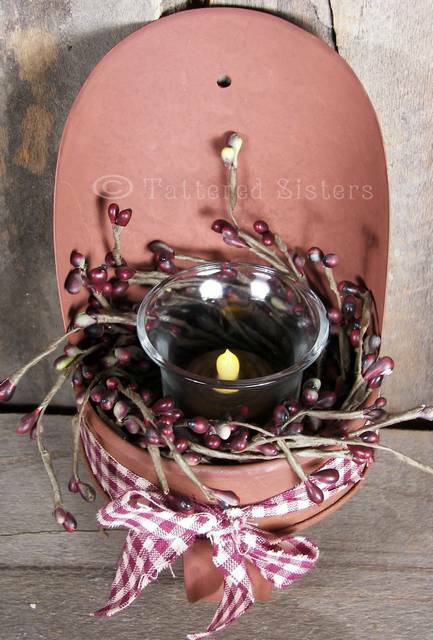 For this project I took a simple, small rusty tin paint bucket, which I purchased from an online craft store. 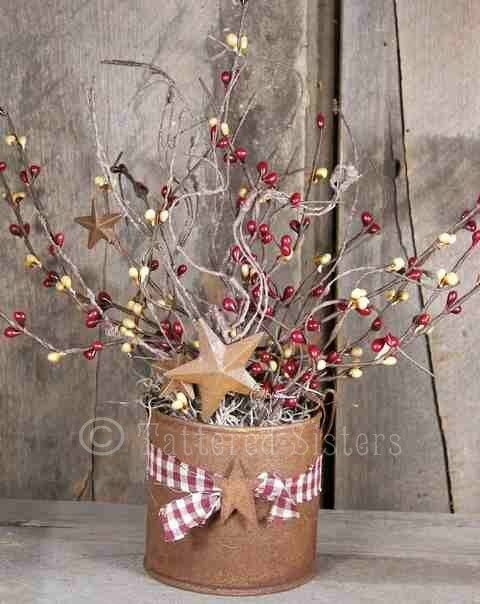 I added a piece of gingham homespun around the can first, and topped that with a rusty tin star shape. Then I put some floral foam down in the bottom of the bucket--enough to basically fill up the bottom of the bucket and support the pip berries. Then I added a couple of different pip berry sprays to fill the bucket, spreading them out to look more full. These sprays have burgundy and mustard pip berries, which are my favorite. One of the sprays had rusty star accents too, which helped tie in with the rusty star on the front of the bucket. And since I didn't want the green floral foam peeking out from the bucket, I finished this off by adding some Spanish moss over the floral foam, to disguise it. 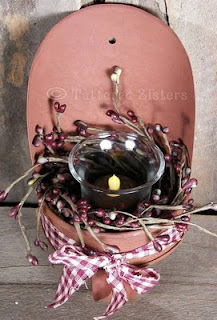 From time to time I am going to share primitive tutorials on the blog. 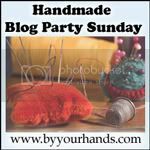 Sometimes they might be my own tutorials, and sometimes they will be links to tutorials that I've run across on other primitive blogs. 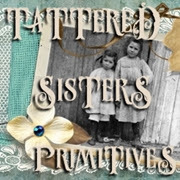 This is the very first tutorial I'll be sharing here at Tattered Sisters. It's a Snowman Ornie Primitive Tutorial, and it appears on The Old Cupboard Door blog. Thank you to Willa for allowing me to share her photo and tutorial link with you! 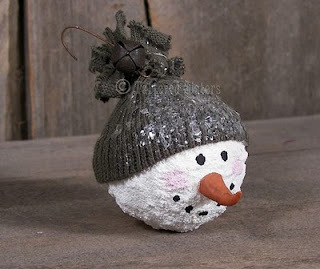 If you're interested in seeing the full tutorial for these adorable primitive snowmen ornies, please click on the link below to visit Willa's blog. These are perfect little primitive ornies. I just love them! One day I was in my studio and realized I had a couple of large rusty tin scoops sitting in there doing nothing. And so, of course, I felt the need to do something with them in the way of making them primitive. So this is the result of some brainstorming and a few extra supplies. My husband had bought me a craft punch that enables me to punch holes into metal, as long as it isn't too thick. So I used that first off in order to make this scoop hang-able. Then I decided it would be perfect as a candle holder...but I also figured that if this were to go on a wall, it might be better if a battery-operated tealight was used instead of a candle. So, I found some spare glass votive cups and some of the tealights and they fit perfectly in the center of the scoop. I always have pip berry candle rings around too, so I used some of them to put around the votive cups. After that, I felt that all this needed was a gingham homespun tie, so I added that around the base, and then I had it: partly country and partly primitive lighting in a repurposed rusty scoop! One of my favorite grungy goods to make are Grungy Clothespins. They're not the easiest things to do since they're long and skinny and have to be dipped in hot wax--without also dipping my fingers in the hot wax too. But they are worth the care it takes to make them because they are so cute and primitive when they are finished. To make these, I always melt my wax in a Presto Pot that I bought just for making my wax-dipped items. It allows me to control the temperature of the wax rather easily, which is important since wax does have a flash point and can burst into flames if it gets to too hot! What I do is melt the wax and then use a heavy duty needle to poke into the inner part of the clothespin's opening. The wood tends to be a bit softer in there and even though it takes a little bit of effort, I can usually get a needle in there. Then I use the needle to hold onto the clothespins when I dip them into the hot wax. I dip them for a few seconds, then immediately roll the clothespin into ground cinnamon until it's fully coated. I do all my clothespins one at a time like this. Once they've all sat after being rolled in cinnamon, then I take each one and dip them in the wax again to seal them. I have found that letting them set a bit before sealing them enables the cinnamon to stick much better during the next dip. So I dip quickly on one side, then the other, then set them on wax paper to dry. 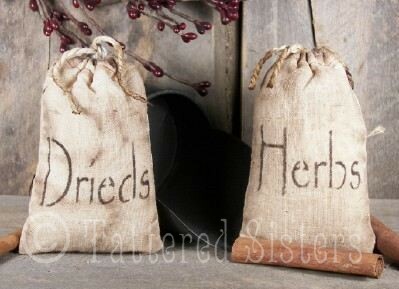 When I sold these in my store, I always wrapped up three of them with a piece of homespun for that primitive touch. These make perfect bowl fillers in wrapped bunches, or just a whole bunch of individual ones together. They also look good on a shelf in a bunch, or you could tie homespun to each top and use them as ornies. I have such an addiction for making things grungy.Grungy bags are one of my favorite things to make. So these are some examples of some of the various types of grungy bags I enjoy making. What's really nice is that these are so easy to make, and the plain muslin bags are so affordable, and I love affordable primitive crafting! I just dip my bags into my special grungy sauce mix several times, and then I wring them out quite a bit before laying them on a cookie sheet. Then I bake them in a 225 degree oven for 10 minutes or so, turning once. I watch them carefully while they're in the oven. Once they're dry I use a stencil and some stencil cream to stencil on the words I want on the front of the bag. Then to finish them off I just stuff them with some fiber fill. 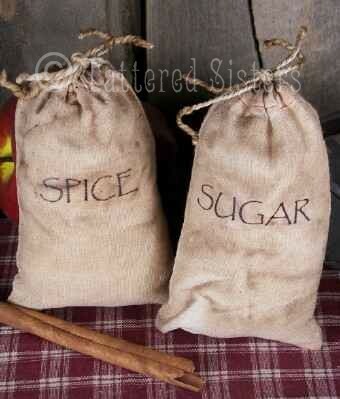 These bags come in all different sizes so there's lots you can do with them. They are cute as bowl fillers, or just sitting on a shelf. You could hang them from a peg rack too and they'd look very cute and prim. This is a grungy little bag that I made that is intended to be a primitive ornie. It could be hung on a tree or even just set on a primitive shelf as decor. I started with a simple muslin bag. I dipped it several times into my special grungy sauce mix, then baked the bag in a 200 degree oven for several minutes until the bag was thoroughly dry. Once that was done, I used a stencil and some stencil paint to add the word Believe to the front of the bag. Next, I stuffed the bag with some fiber fill to get it nice and plump-looking. 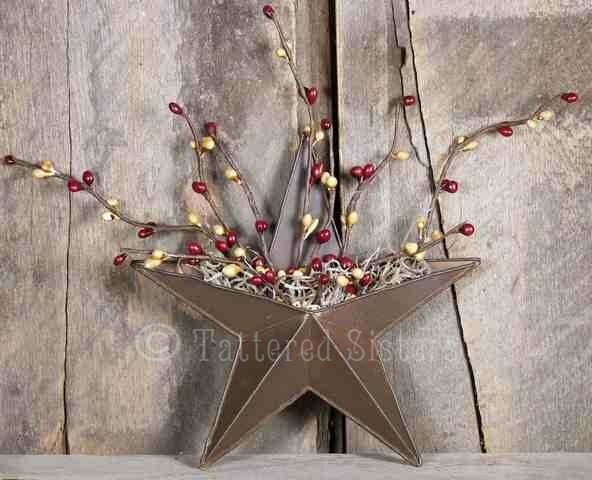 Then I added a rusty star accent, along with some pip berry stems to give the ornie even more of a primitive touch. 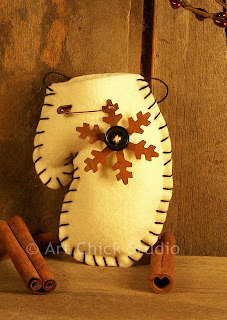 This is another fun primitive snowman ornie that I created for a swap. I had never made ornies quite like this before, so I was learning as I made them. But I think they are so adorable. They could even be grungy'd up really well to be even more primitive, but I liked how they looked once they were finished, so I didn't want to mess with them anymore after that. I started this with a simple Styrofoam ball, about 3" in diameter...but you could use any size you like. 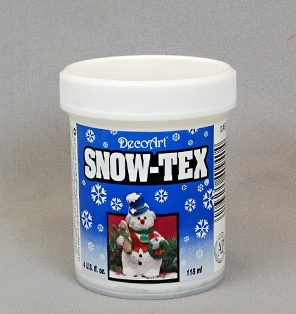 Then I used a product called Snow-Tex, which is made my DecoArt. I took some heavy craft wire and poked it through the bottom of the Styrofoam ball so that I could hold it without touching the ball. Then I slathered the Snow Tex all over the Styrofoam ball until it looked very much like a wet snowball. When I finished that I stuck the other end of the craft wire into a hunk of floral foam so that the ball could dry completely. While the snowball was drying I worked on creating the hats for the primitive snowmen. I used baby socks for that, cutting the end off (the toe-end) the socks. Then I stitched together the cut end, and took scissors and created slits all the way around the open ends, which created the curly-look on the ends of the hat. Once the snowballs were dry, I painted on the primitive snowman's face. I also used some tacky glue on the end of a resin craft carrot nose and stuck that in the middle of the face. 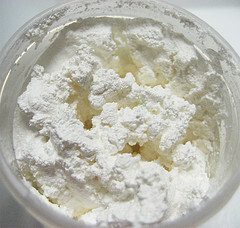 When the face was dry I sprayed some adhesive on the hat and sprinkled on some mica flakes to look like snow. Then I finished off the hat with a hook and a rusty bell, for that perfect primitive touch. 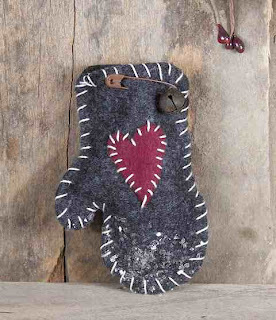 This is a Primitive Heart Mitten Ornie that I created for an ornie swap last year. It was the first primitive ornie that I created using felt. I created the pattern myself and chose a nice, charcoal gray color for the mittens. Then I chose a deep red for the heart shape. I stitched the heart onto the front of the mitten first, then stitched around the edges of both mitten pieces to join them together. Next it was time to embellish. I added some spray adhesive to the tip of the mitten and then sprinkled on some mica flakes to look like snow. Then I finished it off with a rusty bell, which I attached with a rusty safety pin. 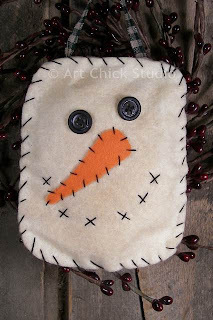 This is a Primitive Snowman Face Ornie that I created for an ornie swap. I wanted something fairly simple, but cute, since I needed to make a lot of these. I used some plain white felt to start that I cut into rectangles with rounded corners. Then I spritzed each felt piece with my special grungy sauce mix and baked them for a few minutes in a 200 degree oven. Once they'd been baked it was time to sew. I added the eyes first using plain black buttons. Then I created noses out of orange felt and stitched those on, and I used simple black-stitched X's for the mouths. Once all the facial features were added I sewed each felt piece top to each bottom--leaving a slight opening to stuff in some fiberfill; and then I attached a piece of homespun for hanging. I sure had fun making these happy little primitive snowmen! I've been a longtime member of the Prim Mart community (love it!) and have participated in their annual handmade Christmas ornie swap four about 4 years now.We make enough of the same ornie to give to everyone who participates in the swap. Sometimes there's a lot of participants--I've made as many as 40 ornies in the past. This year we made 26...a lot more do-able. But no matter how many participants there are, I always get excited to receive my box of handmade primitive ornies each year at Christmas time. I made myself a template out of cardstock first and cut two pieces of plain white felt for the mitten. Now, the prim 'n proper thing to do would have been to grungy up this little white mitten. And I did think about it for a minute or two...but I just decided that I liked the crisp, clean look of the white felt this time, so I left it as-is. Once I had the mitten pieces all cut, I stitched them together around the edges using black embroidery floss, leaving the top open for stuffing. I just love the contrast of dark against light, and I think the contrasting stitching always helps make things like this a bit more primitive-looking anyway. Next, I took black buttons and sewed them to my rusty snowflakes using white embroidery floss. And then I just attached the rusty snowflakes to the mitten fronts using a rusty safety pin, and sewed on some black embroidery floss for hanging the ornies. The final step was to add just a wee bit of fiber fill to the mittens, to plump them up a bit. I only had time for one ornie swap this year (sometimes I've done more than one because I belong to more than one primitive community), so I was so thrilled when my box of ornies arrived in the mail. My Christmas tree is now, literally, quite full of beautiful, handmade, primitive ornies, made by talented primitive crafters all across the U.S.--and even abroad! I treasure all of those ornies more than I can even say, and I love looking at them on my tree each year. And I have so many of those handmade ornies at this point, I am probably going to have to start putting up a second tree somewhere, because if I keep doing ornie swaps, I'm just not going to have anymore room on my tree! To me, this is a wonderful dilemma to have.